Sparkling wine the old-fashioned way at Schramsberg. As you wind your way up the steep, twisting road near Calistoga that leads to Napa’s Schramsberg Vineyards, you sense that something very special awaits. And indeed it does. In my opinion, there are two “must visit” locations in California’s wine country, both in Calistoga: Chateau Montelena and Schramsberg. Both are beautiful, historic properties and vineyards that produce world-class wines. In my mind, in fact, Schramsberg makes the best domestic bubbly you can buy. Schramsberg winery, a registered historical landmark, was founded in 1862 by German immigrant Jacob Schram. In 1880, Robert Louis Stevenson visited Schramsberg and wrote about his stay in Silverado Squatters. During this time, the winery produced only still wines, including Zinfandel, Riesling and Sauternes. In 1912, the winery ceased operation and closed, lying dormant until 1965, when the Schramsberg property was purchased by Jack and Jamie Davies. In 1967, Schramsberg would produce the first-ever vintage-dated American Blanc de Noirs. 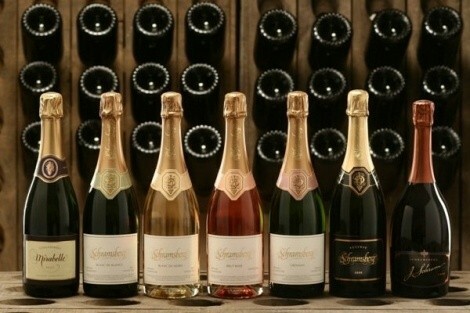 Skip forward to the present era and you’ll see Schramsberg doesn’t rest on its historic laurels. In 2009, the winery received certification under both the Napa Green Winery program and the Napa Green Certified Land program. In 2010, a 466,806 kilowatt-hours solar array consisting of 1,655 panels was installed. Still, Schramsberg wines are made the old-fashioned way, producing sparkling wines with Pinot Noir and Chardonnay grapes and aged in historic caves that date back to the late 1800s. Wandering through those chilly caves and tunnels is a dizzying experience; at any given time, as many as 2.7 million bottles are aging there. Schramsberg bubbly ages from 2 to 10 years before release. In those dark caves are wine bottles stacked as high as the eye can see. I can’t verify the truth of this claim, but I was told during a personal tour of the Schramsberg caves that it is the only American sparkling-wine maker that does hand riddling—the process by which the bubbly bottles are placed on special racks called pupitres and turned periodically by hand, causing the lees to settle in the neck of the bottles. While manual riddling is done for France’s prestige cuvées, high labor costs have resulted in most wineries using mechanized riddling machines. The Schramsberg cuvées include their signature, vintage-dated Blanc de Blancs, Blanc de Noirs, Brut Rosé, Crémant, Reserve, non-vintage Mirabelle Brut, the prestigious (and pricey) J. Schram and Querencia (a Brut Rosé, the sales of which benefit the Jack L. Davies Land Preservation Fund, which supports agricultural preservation and education efforts in Napa County). Tasting Schramsberg’s most expensive offering—J. Schram Rosé ($130)—was the highlight of my winery tour. It’s a gorgeous wine with hints of blood orange and watermelon, with a crisp, tangy finish. The regular J. Schram Brut ($100) has lemon and melon flavors, with vanilla notes and high acidity, which makes it very food-friendly. Schramsberg Reserve ($90) is a Pinot Noir-based sparkler, a fruity, creamy wine that is meant for aging and represents only 3 percent of the winery’s annual production. Don’t fret, though: You don’t have to drop a Franklin to enjoy Schramsberg. The always lovely and dependable Chardonnay-based Blanc de Blancs sells here for $34.99 ($19.99 for a half bottle), and the beautiful Blanc de Noirs—one of my very favorite domestic sparklers—is priced at $37.99. Or, for $2 more you can buy Schramsberg Brut Rosé. For a creamy, semi-sweet treat, there is Schramsberg’s delicate, off-dry Crémant Demi-Sec ($37.99). Or, in the terrific bang-for-the-buck bubbly category, try Mirabelle Brut Rosé ($26.99); it’s about as classy and elegant a nonvintage sparkling wine as you’ll find, which may be why Wine Spectator awarded it 93 points.